3- Many sources for the data i.e. Variety of data sources. These 3 Vs = Velocity (speed) Volume (size) Variety (sources) represents what is named the big data, such data is usually semi-structured data from different sources. Apache Hadoop is an open-source framework written in Java for distributed storage and distributed processing of very large data sets on computer clusters built. So we are discussing here 2 concepts in hadoop distributes storage and distributed processing. In Hadoop Data stored in HDFS : Hadoop Distributed File System where each file is splitted into blocks (default size of each block is 64MB) blk_1, blk_2, etc..
Each block is replicated 3 times in Data Nodes (for data redundancy) (this means if u have 100MB of data you'll need 300MB of storage). 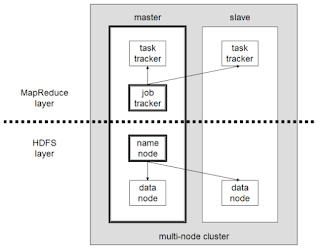 and if any node failed, hadoop will auto-replicate the data into another data node. The Name Node determines the location of different parts of each file stored in HDFS. Name node is stored usually in NFS (Network file system) for higher reliability and it runs also on active-standby node model where the standby node can take over if active node failed. We have 2 concepts here; the mappers and reducers for distributed data processing. - Each Mapper works in small set of data and produces intermediate records in a (key, value) pairs format. - The Reducers can reduce the data into format (key, values). - Finally if we have multiple reducers additional step is required to merge and sort the keys to produce the final required results. Job Tracker is responsible for splitting the work into different mappers and reducers. In each data node, a Task Tracker exist which will usually assign the existing data block to the mapper in the same node to reduce the required network traffic but in case the current mapper is busy (for the 3 copies of the data block) the task tracker can delegate the task into a different data node mapper and stream the block into that node but this happens rarely. Combiners can do some reduction to reduce the data moved over the network. Filter the records, do not change them, keep some and discard some. The output is subset of the original data-set. Each mapper find the top-n list and the reducer produce the final top-n from these lists. e.g. Counting, Min/Max, Statistics, index, etc. e.g. count, min/max, first/last, mean, median, average, etc. the data must be linked in the source using FK and must be structured in row-based. 4) Others such as Organization, I/O, ...etc.